Rain hammering down. Well, it was the Lake District. In October. The Outdoor Writers and Photographers Guild always holds its AGM weekend somewhere scenic and this year it was at the Newlands Adventure Centre in Stair in the Newlands Valley. 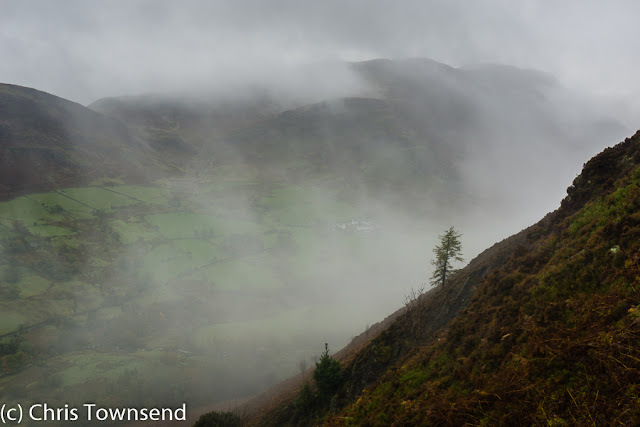 Right above us steep bracken and grass slopes rose into the mist. Somewhere up there was Causey Pike. The morning of the AGM six of us decided to climb the hill despite the weather. After all, why come to the Lake District and not venture into the hills? The ascent was enlivened by easy scrambling on the initial steep slopes of Rowling End, the rocks greasy from the rain. Waist-high bracken hanging over the path ensured that those of us not wearing overtrousers quickly had soaking wet legs. It wasn’t very cold and I reasoned I’d have been nearly as damp and probably more uncomfortable with overtrousers than without. My camera is more water-sensitive than my legs and stayed in its case. For photos I used my smartphone, which is waterproof. Occasionally the clouds thinned to give hazy views of shadowy hills, green fields and shining Derwentwater. The rain came and went. Hoods went up and down. The mist was damp anyway. 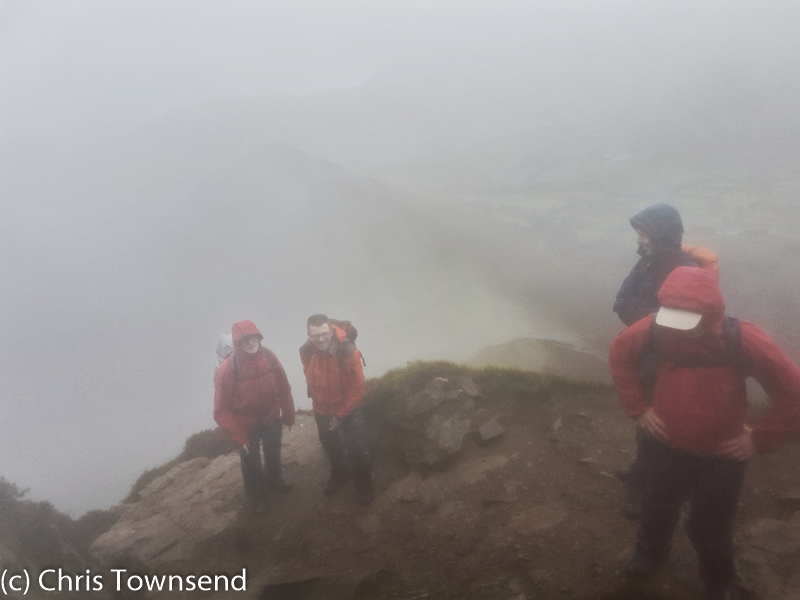 Staying completely dry wasn’t possible, especially as the wind grew stronger as we climbed. On the summit I recorded gusts of 48mph. Enough we thought and cut down to the path by Stonycroft Gill. One hill would do. The next day the weather was no better with the hills still hidden. The forecast was for rain, low cloud and high winds. 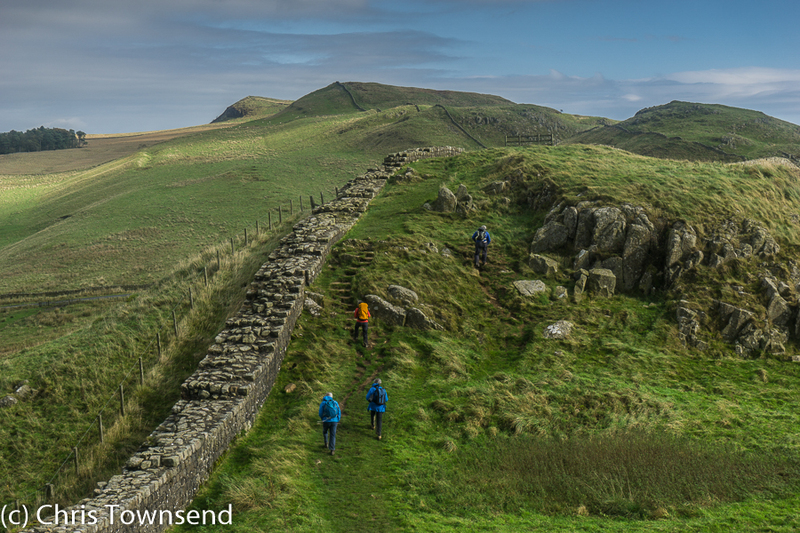 I was glad I’d put myself down for a trip east to Hadrian’s Wall, somewhere I hadn’t been since the 1980s. The day began though with a visit to 12th century LanercostPriory, which is partly built with stones from Hadrian’s Wall. 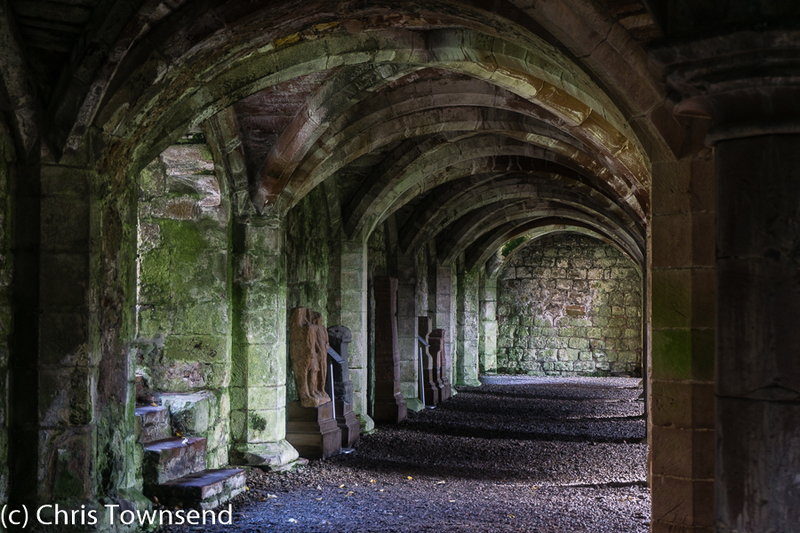 This gaunt ruin is quite dramatic, as is its history, and there’s a particularly fine vaulted undercroft. 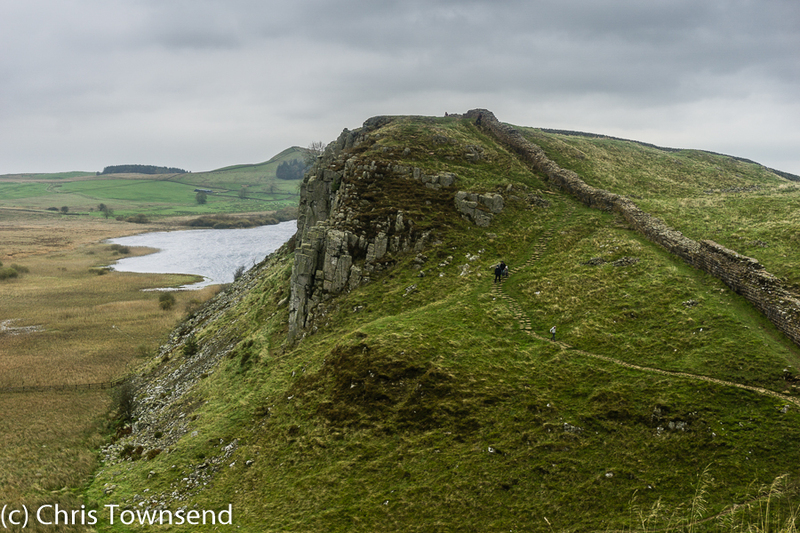 After Lanercost came the Wall itself and a walk from Cawfields Quarry to Sycamore Gap that took us over Winshields Crag, the highest point of the wall, and which gave excellent views of the Wall undulating over the hills. 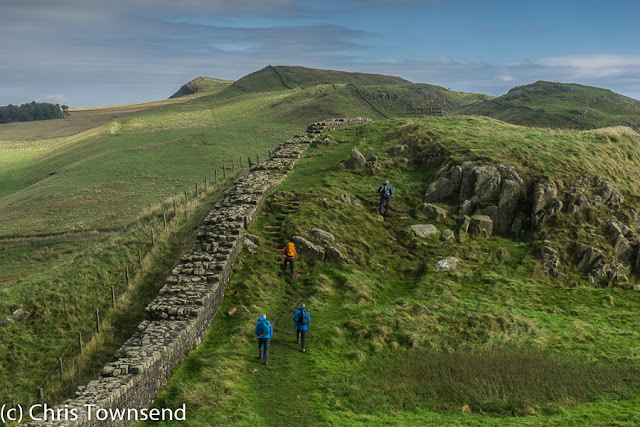 We looked at mile castles and the dead straight line of the Vallum, thought about patrolling the Wall in Roman times, and learnt much from our guide Mark Richards, author of the Hadrian’s Wall Path guidebook. The weather was blustery but with only spots of rain until we left the Wall. To the west dark clouds hid the hills. This was the place to be. Dropping down from the Wall in the rain we walked to The Sill, a futuristic-looking building that is the Northumberland National Park’s National Landscape Discovery Centre. 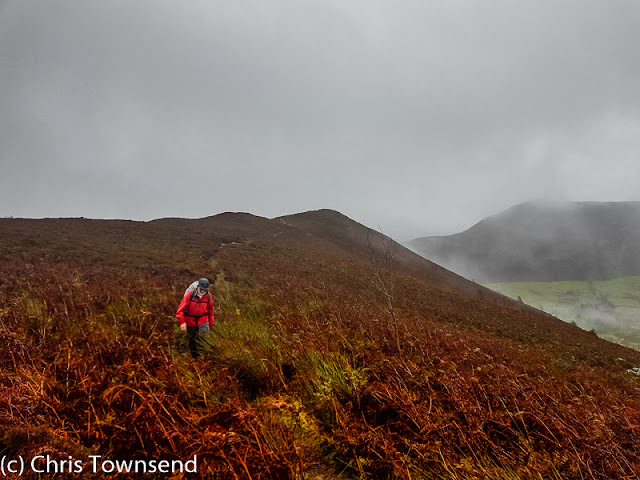 Wet and starting to get chilly – soaked legs again – I’m afraid we were most interested in hot drinks, feeling we’d discovered enough landscape for the day.